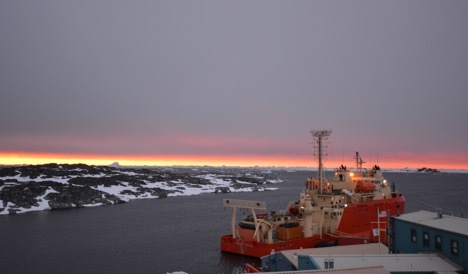 Hello from the U.S. Palmer Station! The weather has been behaving and we were able to have a very productive week. Because of the warmer temperatures in Antarctica this time of year, some long-distance travelers from the north came to visit us – a group of more than 100 arctic terns have made their way down for the summer. The arctic tern is an incredible bird that only weighs as much as a small apple yet it migrates farther than any animal on Earth. 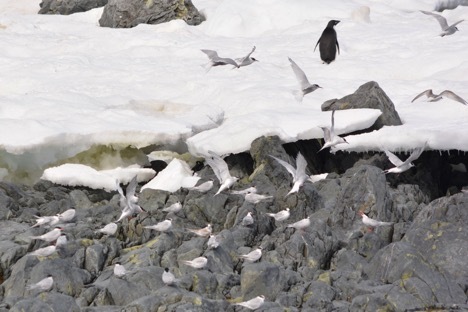 They breed in the Arctic during the northern summer and they travel to the Antarctic for the austral summer to feed in the rich waters of the Southern Ocean. They will travel some 45,000 miles every year and may live for decades. This bird lives a full life; it flies the distance to the moon three times over. It is absolutely inspiring watching these weary travelers make it down here, knowing they were at the top of the world just a few months ago. Back in Michigan, the Detroit Zoological Society helps conserve two different species of tern – black terns and common terns. The DZS has worked with other agencies to develop and maintain a new nesting site for common terns, which have become quite uncommon along the Detroit River over the last 50 years. We are also working with the National Audubon Society and the Michigan Department of Natural Resources, looking at nesting success of black terns in the St. Clair Flats. Black terns are suffering population decline across their range and we are committed to learning more about their life history in order to reverse this trend and protect the species. Besides the arctic terns, we have been very busy studying the local birdlife. 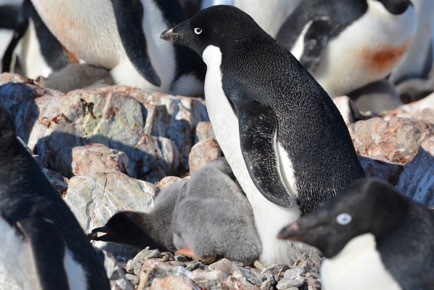 The Adelie penguin colonies seem to show some variation with regard to what stage of development the chicks are in. Some of the chicks are getting huge and the nests are getting crowded as many proud parents have two chicks growing well. That being said, the noise level continues to climb and the colonies are starting to become messy! It does appear that the chicks pick up bad habits at a very young age (stealing rocks from the neighbors). The brown skua chicks continue to hatch and grow as well. We have been measuring their beaks and routinely weighing them, tracking their growth. The parents can be a little feisty, but overall they tolerate us well. The chicks are beginning to run around and explore, which can make it tougher for us to find them. As the days of this incredible journey continue to pass, the northern hemisphere has started to tilt back toward the sun and our days are shortening a touch. It’s still pretty much always light out, but it’s getting slightly easier to see the sun set. Have a great week; I will report back soon! 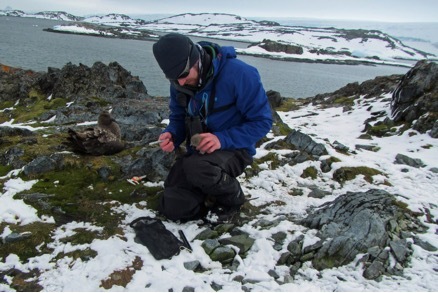 – Matthew Porter is a bird department zookeeper for the Detroit Zoological Society and is spending the next few months at the U.S. Palmer Station in Antarctica for a rare and extraordinary scientific opportunity to assist a field team with penguin research.